Mix everything together! It's seriously as simple as that. I added ground parsley to mine but it's not a deal breaker. This recipe is easy to prepare in advance and in bulk for all your backcountry trips. I typically will make a few baggies of the grits mix at a time so I can just grab it and go. Also, important to note that the grits I used are not the quick 5-minute grits but are the 'traditional' grits. They take about 12-15 minutes to cook but are so worth it for the smooth texture that traditional grits offer. If you grew up in the South eating your mama's grits you probably have a preference and that's totally cool. I am all for taking a recipe and adapting it to fit your health and lifestyle. I was trying to be very diligent and not spill the grits on my counter while I taking photos and as I was going to put them back into the container, I spilled them all over the counter. I cursed, then laughed, then took more photos, obviously. Life is always reminding me that things can't be perfect all the time and sometimes the unexpected is better than what your original idea of perfection was. 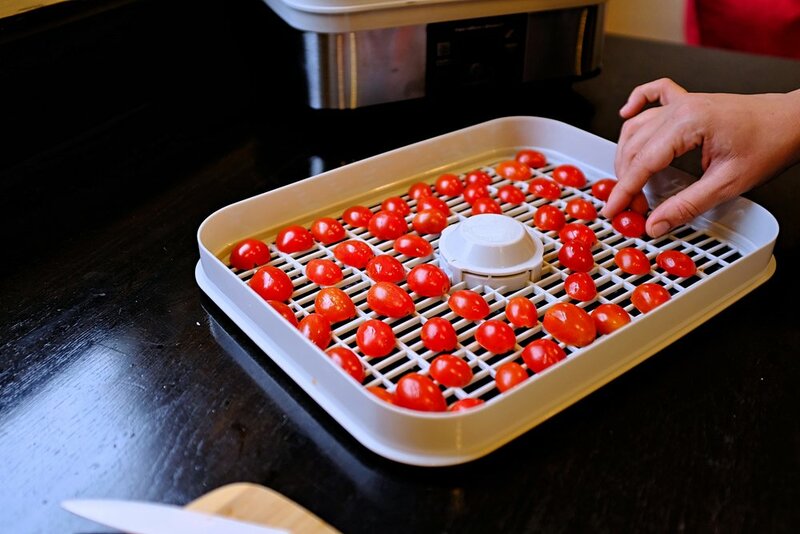 Place tomatoes on dehydrator trays. 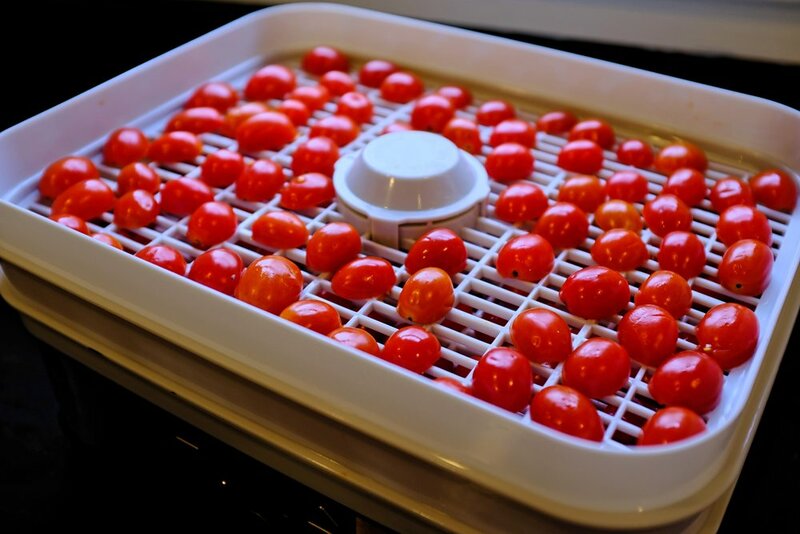 Set food dehydrator to 135° for 10-12 hours or until the moisture from the tomatoes is completely evaporated. The time needed will vary according to your humidity levels. Your tomatoes should be dry but pliable with no remaining moisture. When you are ready to eat, just turn on your stove! I use the Snow Peak LiteMax titanium stove with a standard fuel canister. The stove weighs 2.0 oz and has a boil time of 4-minutes 25 seconds per 1 Liter of water, making it ultralight without sacrificing any utility. Turkey bacon in this recipe is completely optional. 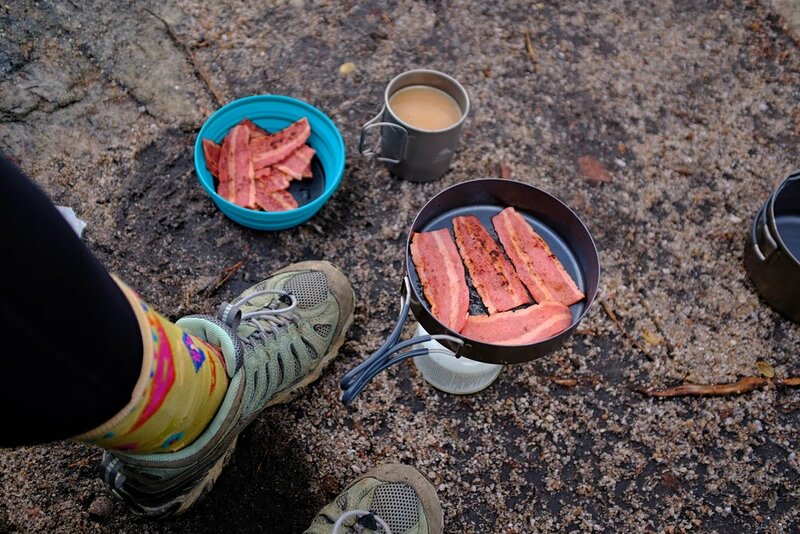 I have become addicted to turkey bacon while camping thanks to my hiking friends who always make it on weekend trips. 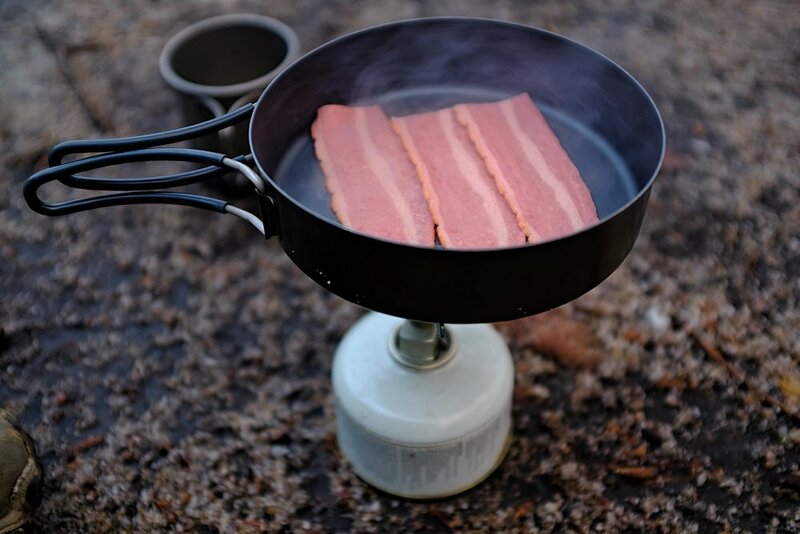 There is something about the smell of warm bacon and hot coffee that gives me the motivation to pull myself out of my sleeping bag in the morning. Turkey bacon is typically pre-cooked and so you do not have to worry about it being refrigerated for a few days. I cut the bacon in half at home so it fits in my pot better when cooking it. I wrap the bacon in wax paper, then foil and put in a separate ziploc bag. Turkey bacon is also leaner than traditional bacon, making it not as greasy therefore you shouldn't have to worry about bacon juice leaking everywhere or a difficult clean up. I use the lid of my pot to cook the bacon first. Cooking about three pieces a time, flipping each piece every minute until desired crispiness after about 4 minutes. The cherry tomatoes will rehydrate as you boil the for water the grits. Empty the tomatoes into the pot, adding in water covering the tomatoes plus about 3-4 inches of extra water for the grits to cook. 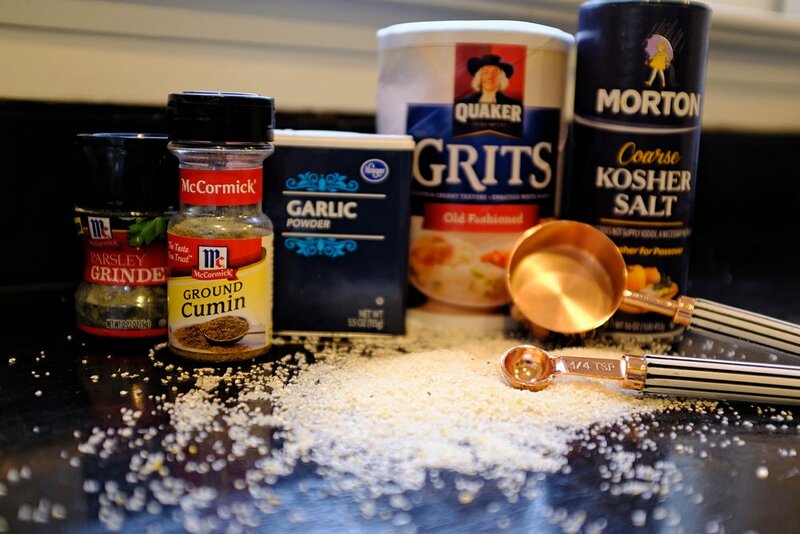 Grits require about 1 cup or 8 oz of water for every 1/4 cup of grits. Once the water starts boiling that the tomatoes are rehydrating in, add your grits to the boiling water. Since I don't carry a measuring cup with me hiking, I usually eyeball it or use a water bottle to help me guess-timate how much water I need. Also, most pots will have markers on the side to help you measure. The best thing I have found to do is to boil less water than you think you need and to add in water as the grits cook. It's always easier to add in water to any recipe and almost always impossible to pour water out. Low and slow is the rule to cooking grits, so turn down the fuel to a very gentle rolling boil, stirring the grits about every minute. The more you stir them, the less of a chance they will burn and stick to the bottom of your pot but it will also give them a smoother texture. After about 12-15 minutes your grits should be ready to eat! When I think the grits are ready, I add in two sharp cheddar cheese sticks and cook until it melts, usually just 2 more minutes or until the cheese is completely melted. Boil and cook times will vary due to altitude. At altitudes above 5,000 feet, meals require a longer boil time due to atmospheric pressure.